Heavy rain and gale force winds caused disruption across the north as Storm Erik blew in today. Ferry services across the west and north coasts were cancelled as a result of gales which reached up 78mph, while a high wind speed of 90mph was recorded at the top of Cairngorm Mountain. The Scottish Environment Protection Agency (Sepa) had flood warnings out across the north as Achnagart experienced 1.1in of rainfall, Tulloch Bridge 1in, Dalwhinnie 0.75in and Kinlochewe 0.73in. 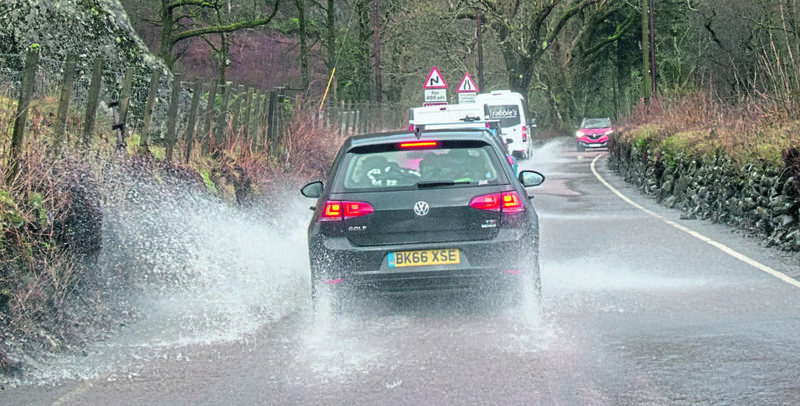 Police warned motorists to drive with caution as a result of the conditions. The Met Office had yellow weather warnings for wind and rain in place until 3pm toda, covering much of the western half of the country as well as the central Highlands. In Oban, flooding blackspot the Lochavullin car park started to fill up in the morning, but subsided before any major damage could be done. Inspector David Hynd said: “The Met Office has issued a weather warning for rain and that conditions for travel across the Highland, Angus, Aberdeenshire, Moray, Perth and Kinross, Stirlingshire, Argyll & Bute areas may be hazardous due to rain and extra caution should be exercised. “In addition, a second Yellow Weather Warning is in place that conditions for travel across the southwest Scotland areas of – Dumfries and Galloway, Ayrshire, Renfrewshire and Inverclyde, Argyll and West Dunbartonshire and south western fringe of the Highlands may be hazardous due to high winds and extra caution should be exercised. Met Office meteorologist Martin Bowles said severe gales would continue on Saturday in the middle of the day around the Moray Firth and its surrounding mountains and hills. He said: “Exposed areas will see gusts of around 60-70mph while it will be around 45mph in cities like Aberdeen and Inverness.